Note from the LeftEast editors: The July 8/9 NATO summit in Warsaw was not much more than the usual spectacular propaganda advertisement with which the Atlantic Alliance countries wanted to show the world their strength and their common commitment to “security and peace”. In fact, beyond the usual internal conflicts between members of the Alliance, the summit took no “historic” decisions, reflecting the diplomatic and military choices of these days. We have previously published an article by Ilya Budraitskis who reported on the NATO summit through the eyes of anti-war activists and opponents of Putin’s policy. 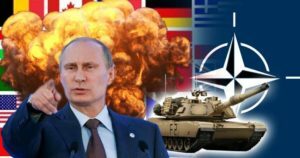 The piece can be read here Neither Moscow, nor NATO: Notes on the NATO summit and the antiwar counter-summit in Warsaw. This piece develops its “neither Moscow, nor Washington” position into a positive program. It is a rejoinder co-authored by Ilya Budraitskis and the long-time activist of international solidarity and anti-war movements Piero Maestri ( Milano, Italy), currently an activist of “Communia Network”( communianet.org). The reading of the final communiqué of the summit of NATO in Warsaw, in addition to being a tedious and a ‘masochistic’ exercise, gives you the idea of the measures the alliance took, and especially about the rhetoric of narrative that supports these measures and the view that the Atlantic Alliance wants to give of itself. As Ilya wrote, the copious lines dedicated to Russia and the “threat” that it would represent in Eastern Europe and the Middle East – directly on the military level are addressed by the strengthening of the NATO military presence in Lithuania, Estonia, Latvia and Poland with up to 3000 troops. At the same time, the communiqué stresses the need to strengthen the “hybrid” capability (http://www.criticatac.ro/lefteast/neither-moscow-nor-nato-notes-on-the-nato-summit-and-the-antiwar-counter-summit-in-warsaw/). We should note that NATO also decided to renew its commitment to occupying Afghanistan despite the fact that several countries of the Alliance have already gone out and in the absence of an exit strategy from the quagmire they left in that country. But the rhetoric about the Russian threat is countered by the suggestion of collaboration with Moscow in Syria and, in perspective, in the whole Middle East. A decision that takes note of the results of Russian military intervention to support Assad and the failure of NATO countries’ strategy in support of the armed opposition. A few days later, US Secretary of State Kerry flew to Moscow to discuss a proposal for direct collaboration on the Syrian front (http://edition.cnn.com/2016/07/15/politics/kerry-us-russia-syria- al-Nusra Front / index.html). The US goal of “stabilizing” Middle East and Arab region after the Arab uprisings and Syrian war has always been clear to those who do not read the reality with glasses obscured by ideology, and today this “stabilization” needs the cooperation of Moscow and Assad himself. It should be stressed that the Italian government has long claimed its position to reopen channels of cooperation with Moscow and that the minister of defense Pinotti considered as an Italian victory to have convinced the allies to take this road. In fact, in Warsaw NATO has shown again the full extent of its structural weakness: on the one hand, we have the largest military alliance in world history, with more offensive and technological capabilities than ever before; on the other, it continues to be troubled by tensions between the different members, so as to make it a gathering of political mediation between the members themselves more than a real military intervention structure. So while NATO reaffirms its “indisputable” political and military assessments – as in regard to its presence in Afghanistan or in its confrontation with Russia, the positions and the actual conduct of the different member countries are drifting far apart. And the internal difficulties of the European Union, particularly in view of Brexit, increase the Alliance’s weakness. * opposition to military action outside the borders of one’s nation state and refusal to allow other countries to use one’s nation state’s territory for foreign interventions in the form of military bases. * opposition to dictatorships, whether friendly or opposed to one’s nation state and a principled rejection of cooperation, political, military, intelligence and diplomatic support. *building a direct relationship and solidarity with all those groups, organizations, movements that are fighting in their countries against militarization, for freedom, justice and dignity. In particular, we have to build a bridge with the pacifists and opponents of Putin’s regime and Arab Revolutionary forces, both of whom are struggling for popular participation and freedom from autocrats well integrated in the geopolitical dynamics. The indivisibility of this agenda is not a way to exclude other demands–but it offers us a path of credibility in the eyes of public opinion in our country and to people and organizations with whom we want to work. We cannot be neutral: we stand close to people who rise against injustice in the Arab region, we are with those who fight against authoritarianism in every country, beyond its geopolitical position – Russia, Turkey, Egypt or Saudi Arabia. Together with antiwar and social activists across the containment line, we need to struggle on both sides of that line, challenging the story of inevitable confrontation and the need to prepare for it, fighting chauvinism and militarism, and building supportive relationships and mutual support.